Responding to Card Tong’s appeal, Card Zen will celebrate a Mass tomorrow for ‘Safeguarding the faith, safeguarding the Cross’ organised by the Diocesan Commission for Justice and Peace. Catholics and Protestants protest outside China's liaison office in Hong Kong. 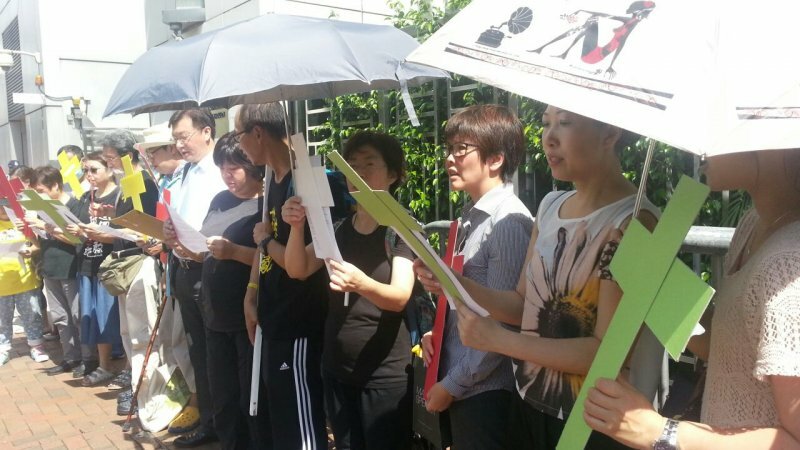 Hong Kong (AsiaNews) – Hong Kong Christians have come out against the unjust dismantling of crosses in Zhejiang and for religious freedom in China. Their actions include an urgent appeal by Card John Tong, a Mass led by Card Joseph Zen, a petition, and a demonstration outside mainland China’s Liaison Office. Cardinal John Tong, bishop of Hong Kong, issued today an urgent appeal titled ‘The Sufferings of the Cross’, calling on China’s central government to investigate and stop all unlawful acts of dismantling crosses. Cardinal Tong also urged Hong Kong Catholics “to choose some forms of penance, such as fast and abstinence and pray for religious freedom, the dignity of the faith and share the sufferings of the Christians” in Zhejiang province. In his appeal, the prelate stressed that “The cross is the sign most representative of the Christian faith. As Christians, we must follow Christ. That requires us to carry the cross together with Jesus Christ”. Thus, tomorrow, 14 August, eve of the feast day of the Assumption of Mary, Card Joseph Zen will lead a Mass in the Church of St Andrew centred on "Safeguarding the faith, safeguarding the Cross." The Mass will end a day of fasting organised by the Diocesan Commission for Justice and Peace and St Andrew’s Parish Social Affairs Group. Like Card Tong’s appeal, Mass and fasting are offered for the suffering of Catholics in Zhejiang, the dignity of the faith and religious freedom. Meanwhile, a group of Catholics and Protestants protested in front of China’s Liaison Office, the mainland’s official representative in the former British colony, to express their opposition to the forced demolition of crosses in Zhejiang province. A statement defending religious freedom in China and calling for a stop to cross demolition gathered more than 1,700 signatures among Christians and Church groups.